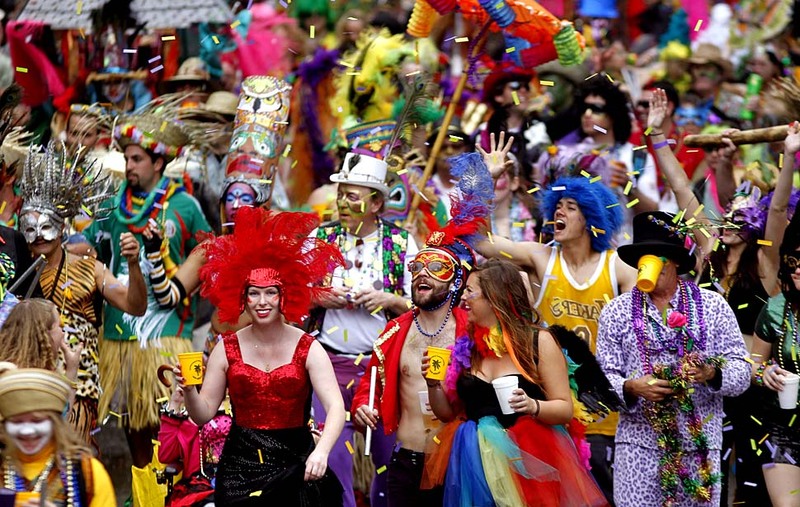 Mardi Gras is everything I want in a day: an excuse to eat decadent foods, imbibe with abandon and generally be merry. This year was looking pretty sad on all of those fronts. Yes, I’ll be cooking up a pancake dinner for the 8th year in a row. But I’m still feeling the effects of the illness knocked me down last week, so I won’t be hosting a crowd. Nor, thanks to my persistent headache, will I be drinking anything stronger than La Croix. People, this is the longest I’ve gone without a drink since I was pregnant with Rory. The frosting on the pity party cake? The kids’ school was closed for a “snow day” due to the drizzle of frozen rain that fell at 3:00 yesterday. I’m sure they had their reasons, and reports indicate some slick spots on the road early this morning. But by the time I was driving the kids to a playdate with my Snow Day Survival crew at 10:00, the roads were not only clear of ice, they were perfectly dry. Sunbaked, even. 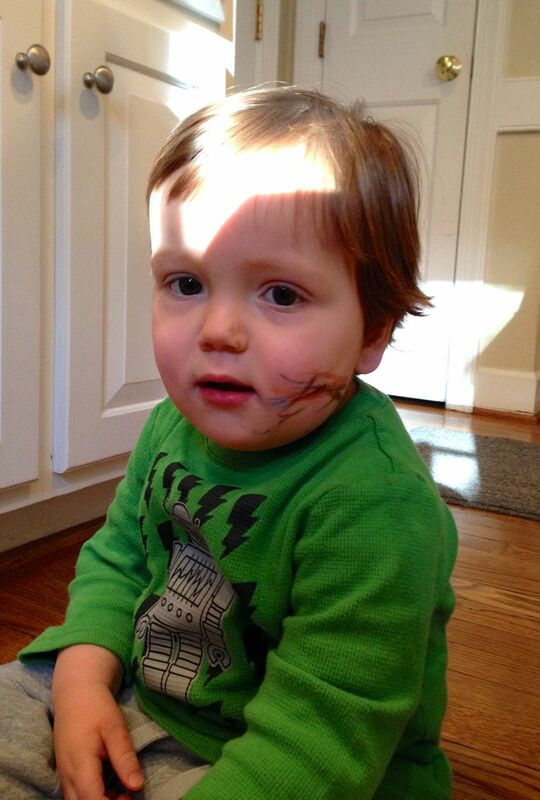 Rory’s snow day activity: a DYI (while Mom’s in the other room) Mardi Gras mask. Needless to say, I was not feeling very festive. All that changed with a text from my next door neighbor, who is a talented (and generous) baker. Attending a Catholic university in Milwaukee changed this. Not only did I get a better sense of the liturgical year and various holidays, I also was introduced to the food that accompanied these feast days. 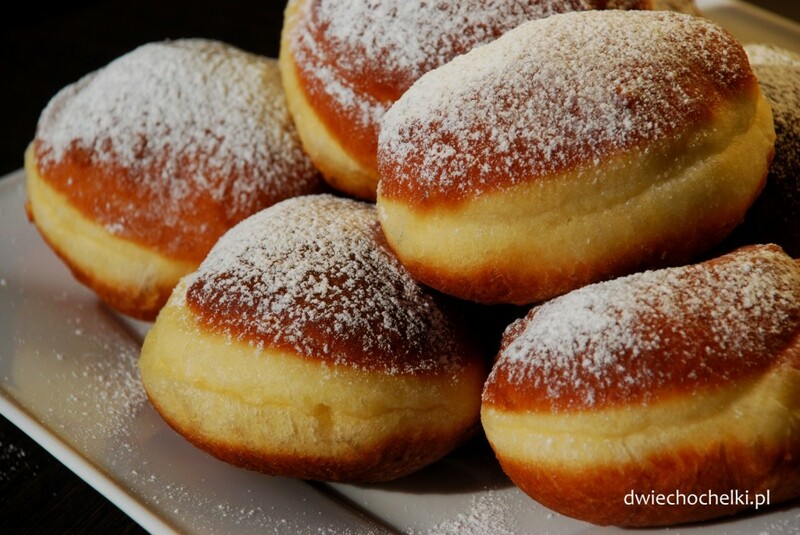 Nice Polish Catholic girls (not unlike my childhood best friend) introduced me to Paczki Day and lamb cakes. Moving to Chicago – which has the biggest Polish population of any city outside of Poland – only continued the party of culinary delights. Living in the south for the last ten years has given me the chance to enjoy plenty of food I never ate growing up: grits, banana pudding, hush puppies, okra. But – unless I am blocking out a very enjoyable memory, and childhood friends, feel free to remind me – it wasn’t until my neighbor’s text today that I had been offered king cake. It would make sense. While Wikipedia tells me that king cake has Catholic roots, its history in the United States seems to be more in the southern part of the country. I had heard of it; though even if I hadn’t, have I ever been one to turn down something with the word “cake” in it? So when my neighbor sent another text saying that she had taken some to the house and given it to Pat (who was working from home in the morning due to the “snow day”), and asked me to tell him to be careful not to choke on the baby, I knew what she was talking about. 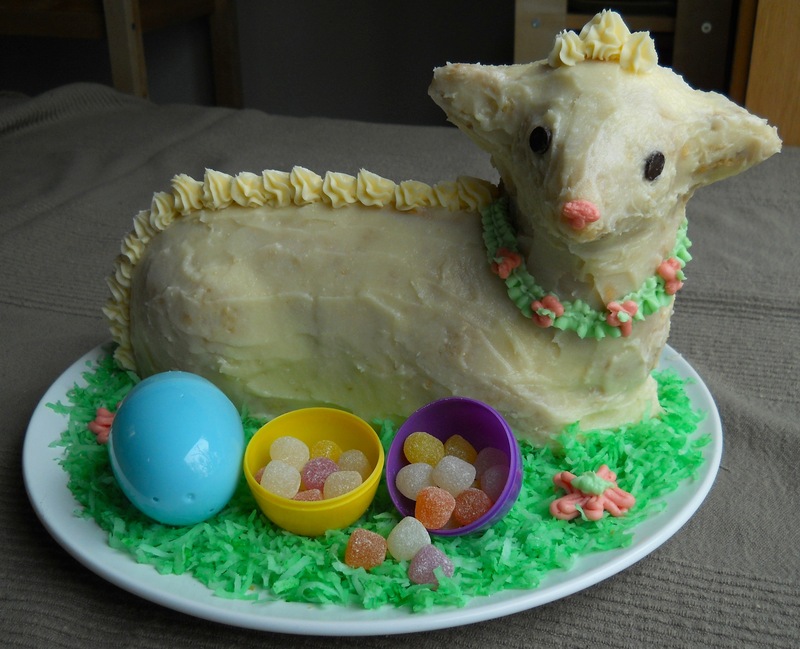 The idea of a baby doll being hidden in cake seemed vaguely familiar. 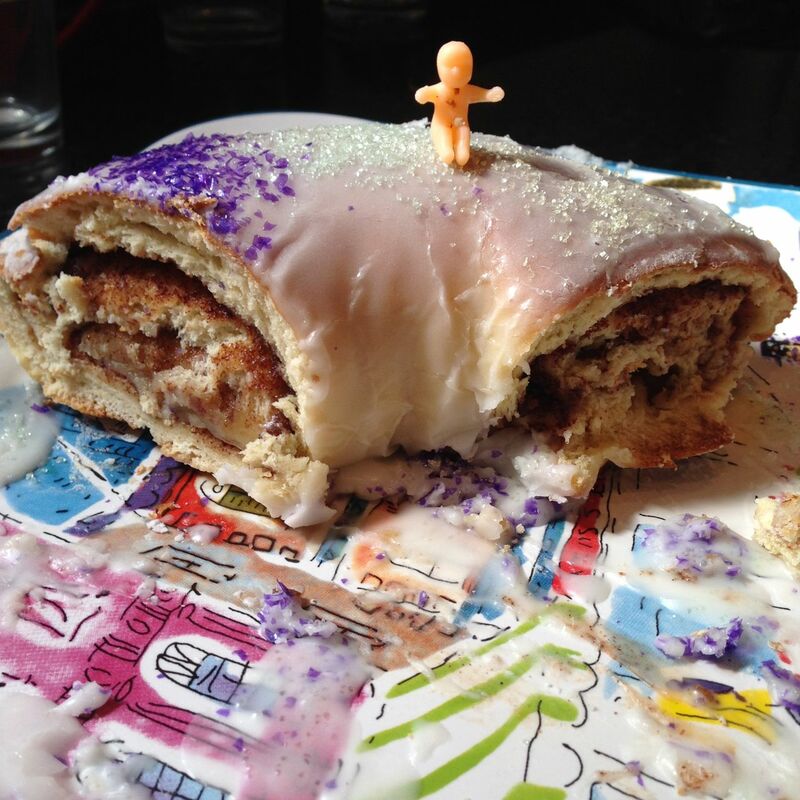 “So, the baby in a king cake is Jesus, then?” I asked my playdate crew. We decided that must be the case. I stepped out of the room to answer. Pat apparently thought that a small plastic doll had randomly fallen into the cake batter when our neighbor was preparing it. And that somehow, perhaps during her afternoon rounds taking inventory of her small plastic doll collection, she had realized one was missing. Pat was gone by the time we got home from the play date. The tiny doll was sitting on the plate next to the cake. And the cake? It was amazing. As perfect as a baked good can be. I mean, look at this. A fine Fat Tuesday after all. And, as I’m planning on another slice of cake, it’s about to get fatter. How do you celebrate Fat Tuesday? What foods do you associate with your ethnic or religious heritage? And on that topic, can somebody send me some good lefse? OK I have never heard of King Cake until this year either. Suddenly it’s all over the place?! How did I miss this confectionery delight? Also this: “Pat once discovered a rubber band in the tuna casserole my mom had made for dinner while she was visiting. “That’s where that went!” she had exclaimed.” gave me the greatest laugh of the day.